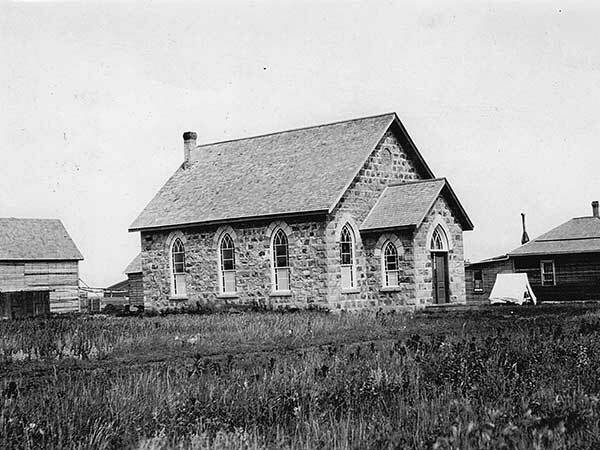 Presbyterian church services in Whitewater, in what is now the Municipality of Boissevain-Morton, began in 1894 when Reverend Robertson of Ninga held them in the local schoolhouse on Saturday mornings. During the winter of 1903-1904, subscriptions by local parishioners were collected and construction of an impressive stone church building was begun. Its cornerstone was laid on 27 June 1904 and it featured stained glass windows and hand-hewn wooden pews. Clerics through the years included Rev. Hamilton, Rev. Munroe, Rev. Law, Rev. Dewar, Rev. Alexander T. Macintosh (c1914), Rev. McNair, Rev. Forster, and Rev. Marshall. Following the 1925 unificiation of the Methodist, Congregationalist, and Presbyterian faiths in Canada, it became Whitewater United Church. The congregation dwindled as the local population waned, and the final service was held in the church in 1947. The building was demolished around 1957 and no vestige of it remains at the site. We thank Natalie Macintosh and Leona Devuyst for providing information used here.